Situated on Dubai’s Jumeirah Beach, in Dubai Marina area this 5-star resort offers luxurious rooms overlooking the Arabian Gulf or the surrounding landscaped gardens. Facilities include a private beach and 2 outdoor pools. The rooms of Habtoor Grand Beach Resort & Spa feature stylish interiors with Arabian touches. All are equipped with a flat-screen TV featuring satellite channels, and a DVD player. Habtoor Grand Beach Resort & Spa has 12 themed bars and restaurants serving cuisine from around the world, such as Lebanese, English, Italian , and Tapas and Grill dishes. 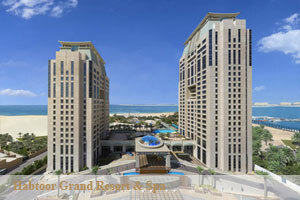 Habtoor Grand Beach Resort & Spa is located next to the Dubai Marina. The largest shopping complex in the Middle East, the Mall of the Emirates, is only a 10-minute drive away. Free private parking is available. FView Hotel Map Click Here!